I was truly enthralled by this book! Bel Canto was good, but for me, this one was even better. I was transported to the Amazon jungle in a fascinating story about science, ethics, and facing one's past mistakes. I had no clue how it was going to end and a part of me did not want it to end. Dr Marina Singh, a research scientist with a pharmaceutical company, is sent to the Amazonian jungle to find Dr. Annick Swenson in hopes of learning about the death of her research partner Anders Eckman, and how the new fertility drug research was proceeding among the Lakashi tribe. As Marina embarks on this adventure, we learn about her past fears and how it has affected her own relationships. Her trip to Brazil and the jungle with its dangers and wonders was so amazing to read that I could not get enough. Truly, Patchett is a master storyteller with her captivating prose, vivid imagination, and intriguing plot revolving on a fertility drug research and the mysterious death of a co-worker. She creates characters that become unique because of the circumstances they are inadvertently thrown in. I liked Marina, Milton and Easter, the deaf boy she becomes attached to. To say more about the story would give away the plot, but suffice it to say it is different from anything I have read. I was unaware how easily my emotions were invested in the characters and the outcome of the story until I came to the ending. It was abrupt and left me with so many questions about the characters and their fate! Because of this, I felt that perhaps the author should not have invested so much time on some secondary characters so as to fully exploit the main ones. The ethical side of the drug research could have been further explored as well. I was frustrated that there was no epilogue just to tie in what happens to them, especially with Marina. Does she take up Dr. Swenson's advice? Does she disclose to Mr. Fox, her employer and lover, what really is going on in the jungle? Does she go back to her regular job after all that has taken place? And what about Dr. Swenson and Easter? Despite all this, I still loved this book. It took me to another place. It made me question what I would have done in similar situations. Reading it during the hot July days was perfect because I felt the intensity of the insect-infested humid jungle atmosphere even more. If you're looking for a different read this summer, don't hesitate to pick this one up. It's an intelligent and thrilling book. Note: This book had two f-words during an intense scene and some sexual references, not explicit. 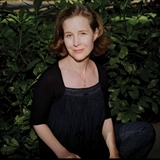 Ann Patchett was born in Los Angeles in 1963 and raised in Nashville. She attended Sarah Lawrence College and the University of Iowa Writers’ Workshop. In 1990, she won a residential fellowship to the Fine Arts Work Center in Provincetown, Massachusetts, where she wrote her first novel, The Patron Saint of Liars. It was named a New York Times Notable Book for 1992. In 1993, she received a Bunting Fellowship from the Mary Ingrahm Bunting Institute at Radcliffe College. Patchett’s second novel, Taft, was awarded the Janet Heidinger Kafka Prize for the best work of fiction in 1994. Her third novel, The Magician’s Assistant,was short-listed for England’s Orange Prize and earned her a Guggenheim Fellowship. Her next novel, Bel Canto, won both the PEN/Faulkner Award and the Orange Prize in 2002, and was a finalist for the National Book Critics Circle Award. It was named the Book Sense Book of the Year. It sold more than a million copies in the United States and has been translated into thirty languages. In 2004, Patchett published Truth & Beauty, a memoir of her friendship with the writer Lucy Grealy. It was named one of the Best Books of the Year by the Chicago Tribune, the San Francisco Chronicle, andEntertainment Weekly. Truth & Beauty was also a finalist for the Los Angeles Times Book Prize and won the Chicago Tribune‘s Heartland Prize, the Harold D. Vursell Memorial Award from the American Academy of Arts and Letters, and the Alex Award from the American Library Association. Visit Ann Patchett at her website. Disclosure: Thanks to TLC Book Tours and HarperCollins for sending me this book for review. 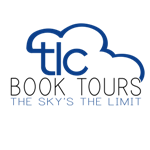 I was not compensated in any other way, nor told how to rate or review this product. I would definitely love to borrow this one at some point! Glad to hear you enjoyed it even more than Bel Canto despite the abrupt ending. I'm definitely looking forward to reading it! Avis, you are welcome to borrow it after Sandra reads it! Thanks, Laura! There's certainly no rush -- after this weekend, I have plenty to read (not that I didn't before as well)! I didn't love this one as much as you did. The middle of the book dragged for me and I really didn't like the ending. I did think Patchett's writing was gorgeous. 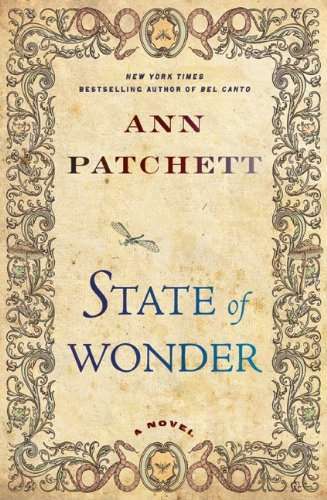 I still have to read Bel Canto and after hearing how much you enjoyed State of Wonder I might have to move it up on TBR mountain (though I think it's in danger of collapsing soon), even considering your frustration at the ending. If I'm not mistaken, I think you said the same sort of thing about the ending of Bel Canto? Maybe that's the author's style? I was wondering the same thing. Maybe it's her style or maybe she just has trouble with endings. Glad that you enjoyed this a lot. I did too. I must read Bel Canto now. 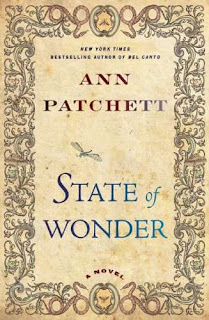 I have heard Ann Patchett's writing is wonderful! I will have to give one of her book a try. This one sounds very good. I loved this book too! She writes such vivid and complex characters. I usually hate open endings, but in this case I thought it was appropriate because it made me think and made the story stick with me longer than I think it would have otherwise. Hmm...the abrupt ending and questions about the characters fates make me hesitant, but I've heard so many good things about this book. Thanks for your different perspectives on the ending. Yes, I have an idea what may have happened afterwards but I LOVED the story so much I guess I did not want it to end. This is a testament to Patchett's awesome storytelling and writing. Don't hesitate to read the book because of the ending. As you can see from the previous comments, not everyone had an issue with it. I really enjoyed the novel, but I thought the ending was absolutely terrible. I'd still recommend it to anyone though!